I've been (slowly) working on this room. I painted the room before Thanksgiving so my in-laws didn't have to stay in something that looked similar to our bedroom. 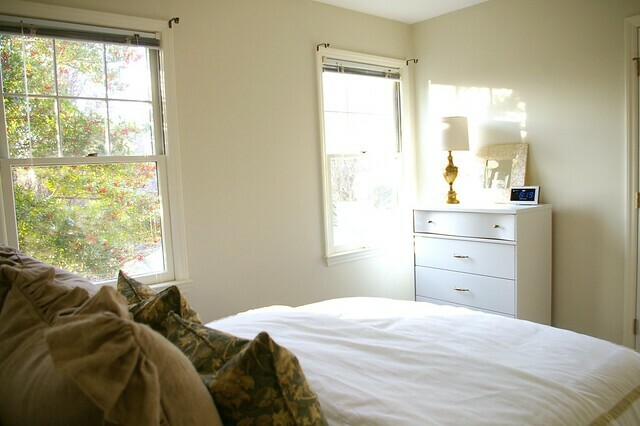 I never really showed an "after", so here are some pictures of the bedroom now! The paint is "Vintage Linen" by BEHR. It's a really great neutral. It's been cold here in Charlotte and I didn't think the coverlet would be enough to keep my mom warm (she is cold natured as am I!) I added our summer duvet and then remembered I had these throw pillows in a box. The throw pillows I purchased from Pottery Barn forever ago and I don't LOVE them.. but they work for now. I DO love the light that this room gets! This is it's temporary spot, but I think it will stay in the guest room. As you can see, I desperately need window treatments and lamps. I'm always keeping lamps for this room in the back of my mind, but so far I have not found any I like. 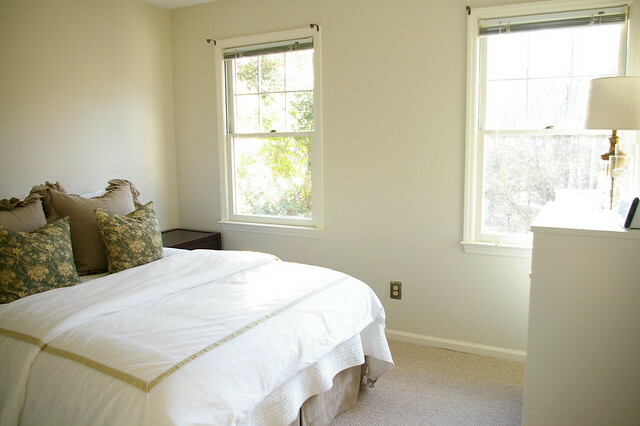 As for window treatments, I think I will do a simple dark bamboo shade. Later down the road a great headboard is in this room's future. This room is looking great. I think any guest would love to sleep in this room. The ruffle pillows on the bed are awesome! And for $15 that mirror would have been in my cart too! That mirror is fantastic! Such a great find! Love love love that mirror. And seriously...if you ever want to sell it, consider my hand raised! 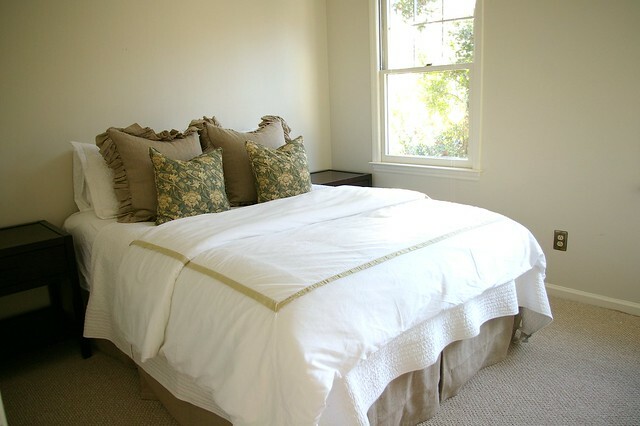 I am loving the white bedding with those ruffled linen pillowcases. I like your blog. Thanks for sharing all these fun projects. ooooh I love that mirror -- perfect! The room is looking cozy! I love your little vignette on the dresser. Great score on the mirror!! I like it even more for $15! Love the mirror! wow $15 is a great buy too. 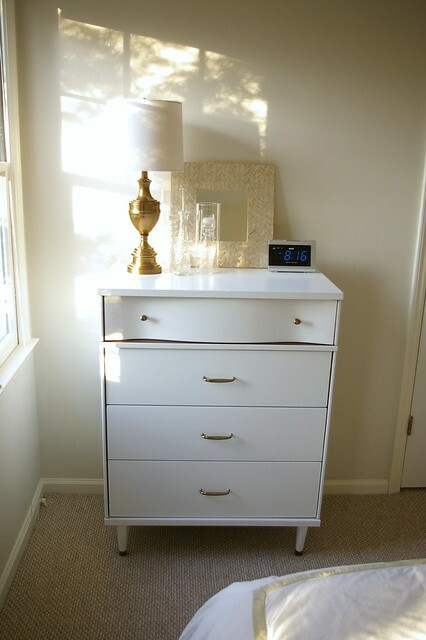 I love the dresser in the room! That mirror was such a steal! 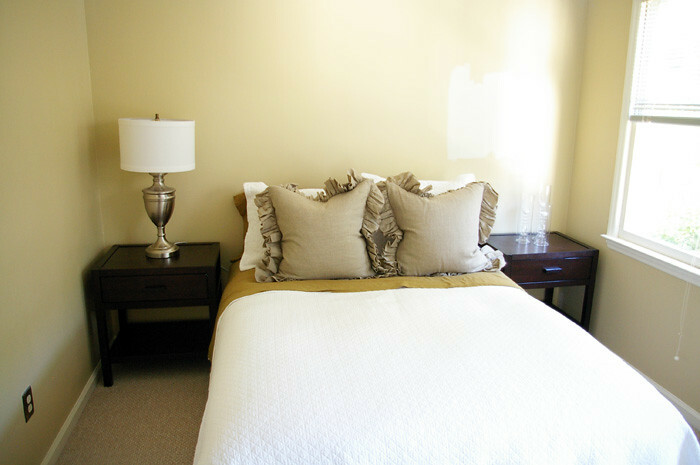 I really like the classic lines and brass color of the lamp on the dresser too! Looks so relaxing! I really like that wall color... finding the perfect neutral is a challenge! I love that lamp. Would you share the source? I've been on the hunt for perfect brass/gold lamps in classic shapes. 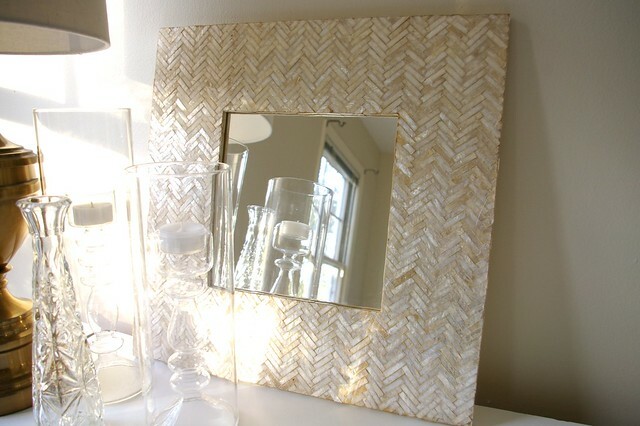 that herringbone mirror is FANTASTIC. i am jealous, yes i am. Capiz plus herringbone?! I am dying! Love it.